A thermal blanket retains body heat and reflects it back on to you so you can stay warm when it's cold. 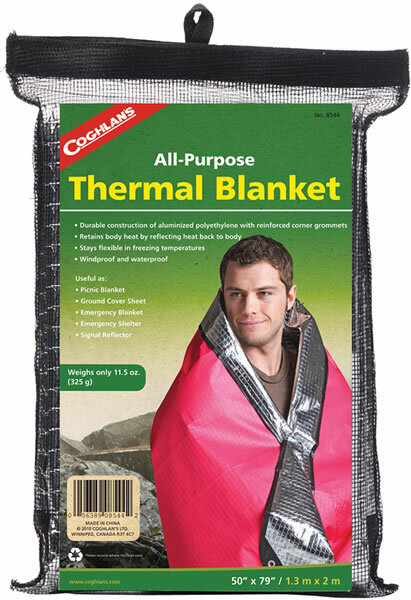 This emergency thermal blanket is windproof, waterproof, strong and lightweight. It's reinforced grommets allow you to tie the corners and fabricate an emergency shelter. Made of layered and reinforced Aluminized Polyethylene, it will keep you warm and is rugged enough for field use. Keep one in your car, boat, cabin, survival kit or bug out bag, and hunting gear. Stays flexible in freezing temperatures. Size: 50" x 79". Not as compact as the emergency blankets but will still fold down to a manageable size. This product is much thicker, increasing it's durability. It does the job and endures many uses. Useful as emergency shelter, emergency blanket in your vehicle, ground cover, signal reflector. Reinforced layered construction of Aluminized Polyethylene is strong, compact and soil resistant. Retains body heat and reflects heat back to body. The corners have reinforced grommets and the edges are stitched. Windproof and waterproof.